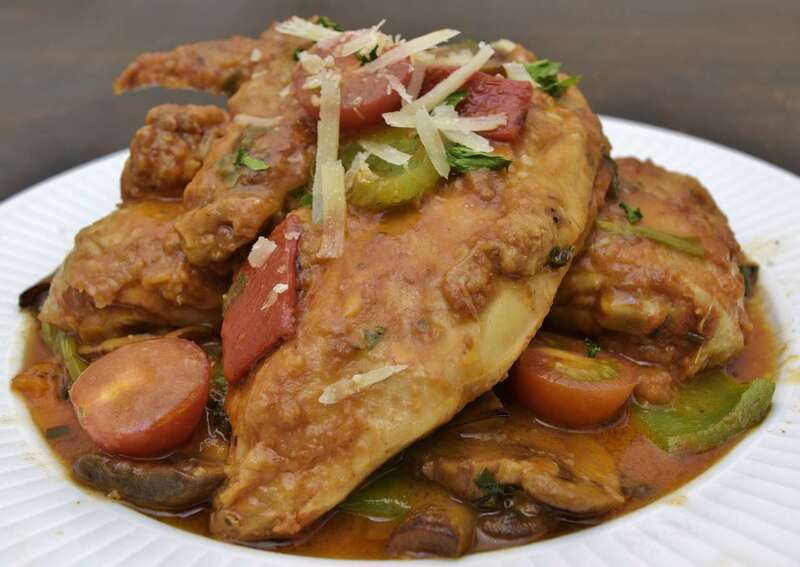 Chicken Cacciatore is a familiar and easily identifiable dish. It appears anywhere from fine restaurants to Sunday dinner at home. Chicken, 1 each, approximately 4 lbs/1.8 Kg, cut into breast, wing, leg and thigh pieces. Flour, 5 oz dry/150 g for dusting. 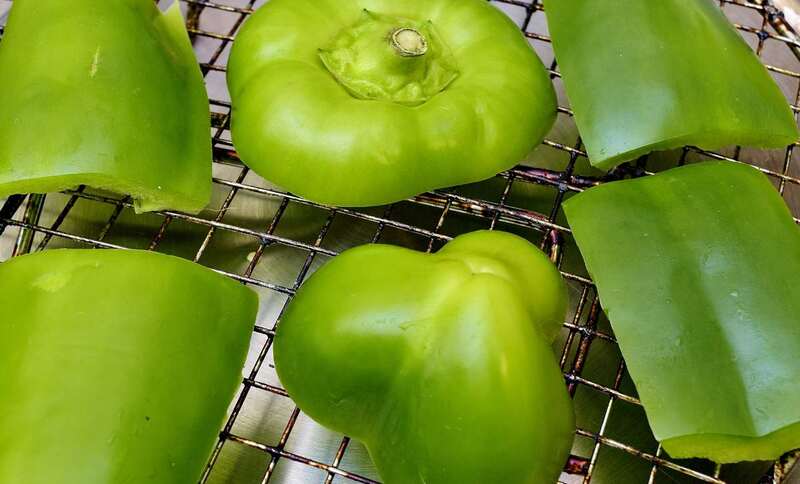 Sweet bell peppers, 1 each; green is the standard, but all sweet peppers are perfectly suitable. 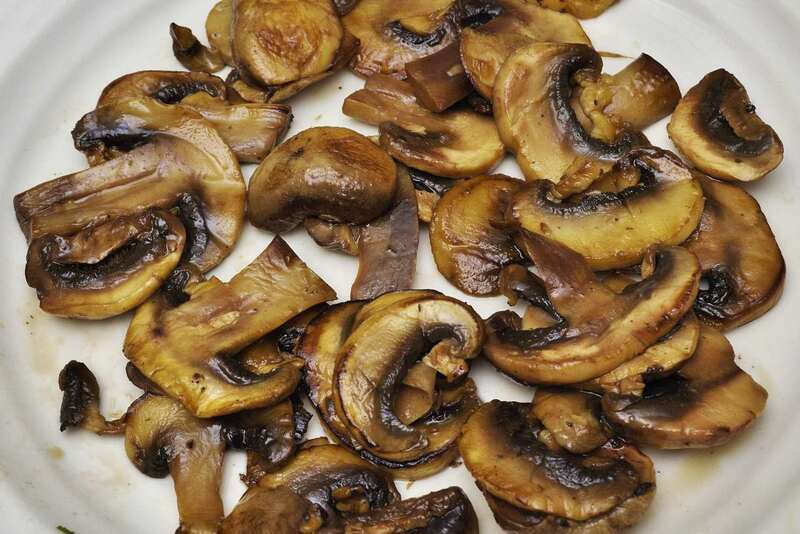 Mushrooms, 4 oz/120 g, about 30 slices. White wine, 4 oz/100 ml. Water or unseasoned stock, 1.5 cups/300 ml. Bouillon concentrate, enough to flavor 2 cups–about 1 teaspoon or one cube. Cured green olives, 6 each. Chopped fresh parsley, 1 Tablespoons. Flour shaker or fine meshed strainer. Flat bottomed skillet, approximately 12″/30 cm. and 3″/90 mm deep. 4 hours or up to 8 hours, whichever suits you. Let sous vide work for you! The chicken may be processed up to 8 hours without any detectable difference. This will pasteurize and preserve the chicken. After the time has elapsed remove the bags of chicken from the bath and submerge in iced/tap water until they achieve 70 F/21 C–about half an hour. Refrigerate to 40 F/4 C–this is necessary to assure food safety. As long as the bags are not opened, the chicken can be kept in this state for at least a week. Note: In the picture above, you can see the individual pieces of chicken on the right. On the left end of the vessel you can see our sous vide chicken stock in process. Cut the ends off of the bell pepper and cut in half down the spine. Remove the seeds and pith. 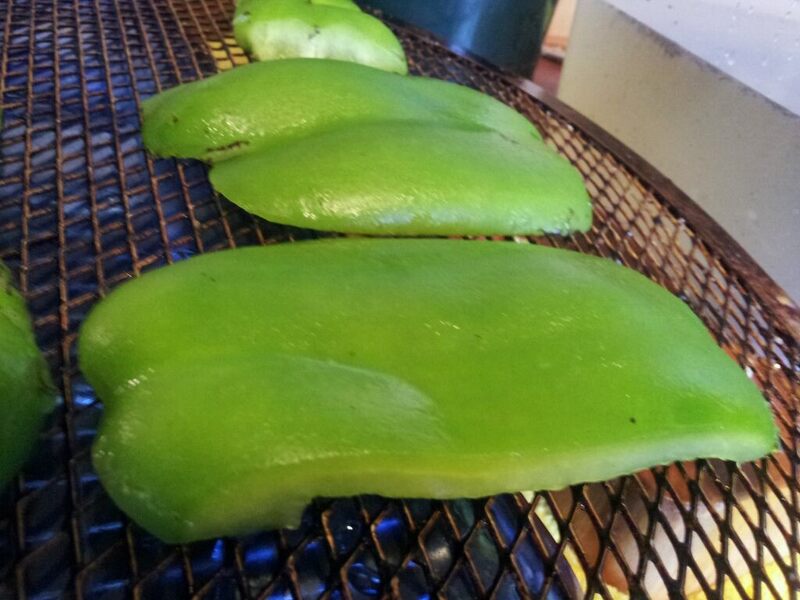 Scorch the peppers with a propane torch or use the broiler function in your oven. Cut into 1″/2.5 cm squares. Set aside. Slice the green onions thin. 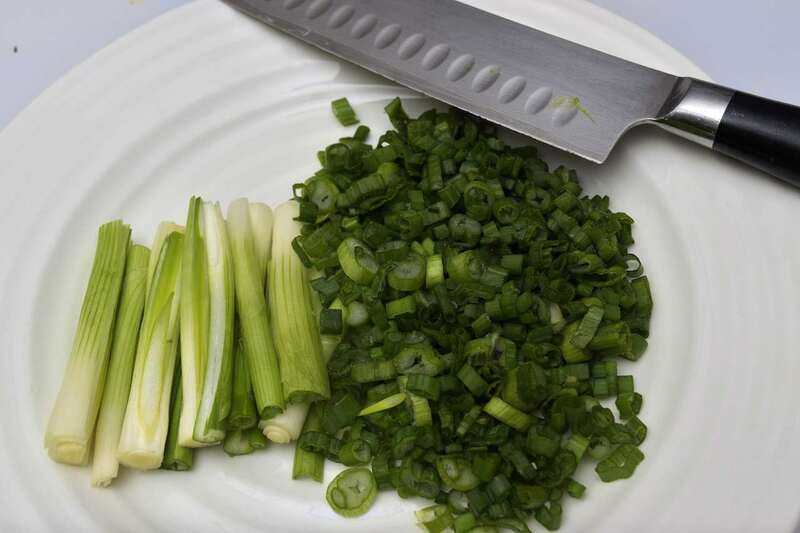 Stop slicing when you get to the white parts of the scallions. Trim off the root end and split lengthwise as shown. Put the pouches of chicken in hot tap water (120F F/49 C) for 5 minutes. Cut open a corner of the pouch and pour out the melted gel. You can clarify it or save it for later. Cut open the pouch and stage the chicken on to a sheet pan lined with parchment or butcher paper. 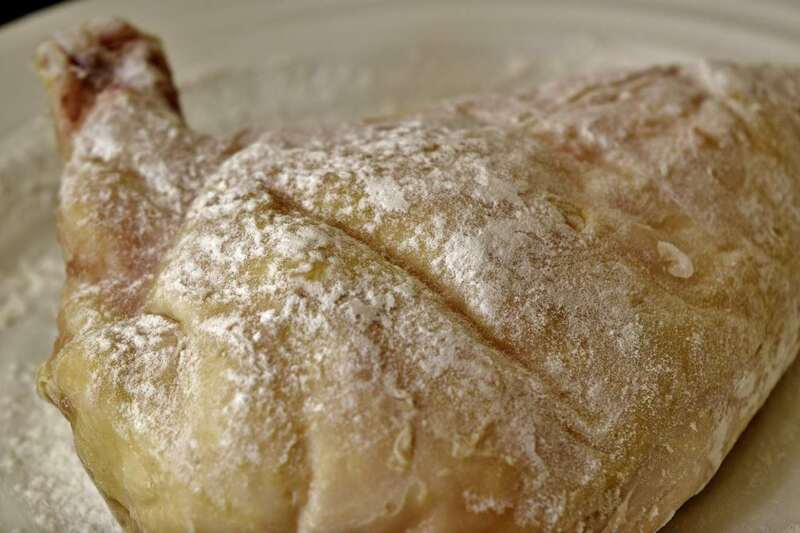 Leave a little moisture on the surface of the chicken–this helps the salt and pepper cling. Mix the measured salt with the cayenne. Sprinkle both sides with the mixture. Shake or sift flour lightly over both sides of the chicken. The only purpose of the flour is to prevent the chicken from sticking to the pan. If there is enough flour to thicken the sauce, you put on too much. Heat the skillet until the surface achieves 225 F/107 C. Add 1/2 cup/100 ml vegetable oil. 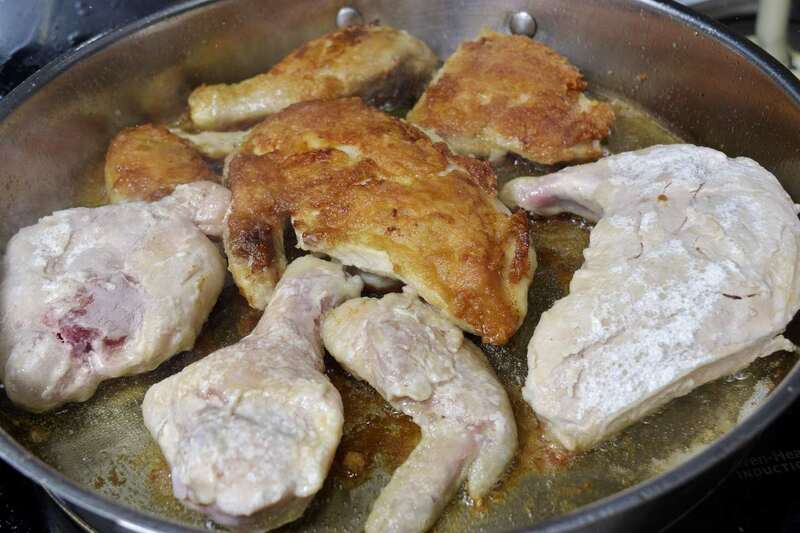 Shake the excess flour off of the chicken as you start adding pieces to the pan, skin side down. Take care to not crowd the chicken. At least 1″/25 mm between the pieces will help them brown faster and more evenly. Brown well. Rotate the pan on the burner to move the hot spots/cold spots around. This also helps the chicken brown evenly. Monitor the temperature of the bottom of the pan by listening–if you hear hissing, the pan is too cold. If you hear popping noises, it is too hot. If you hear sizzling, you have it just right. Adjust as needed. Only turning the chicken once yields the best results. 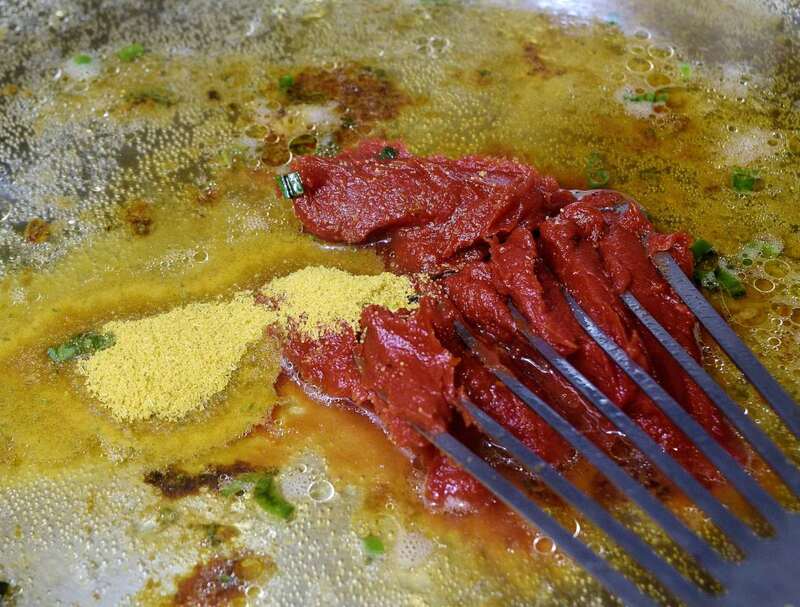 Use the tongs to lift it up and check for color. It is unlikely to scorch at this temperature. When the chicken takes on the desired color, turn it over and brown the other side. 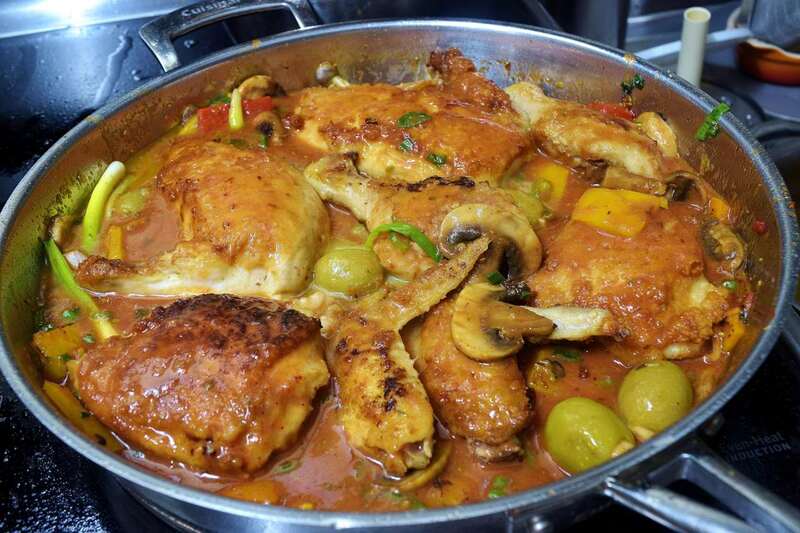 If there is room in the pan, you can slide the first batch up and add the second batch–again–do not crowd the pan. The internal temperature should achieve 140 F/60 C. Set aside. If your oven has a warming function, you can stage the browned pieces of chicken there on a sheet pan.. 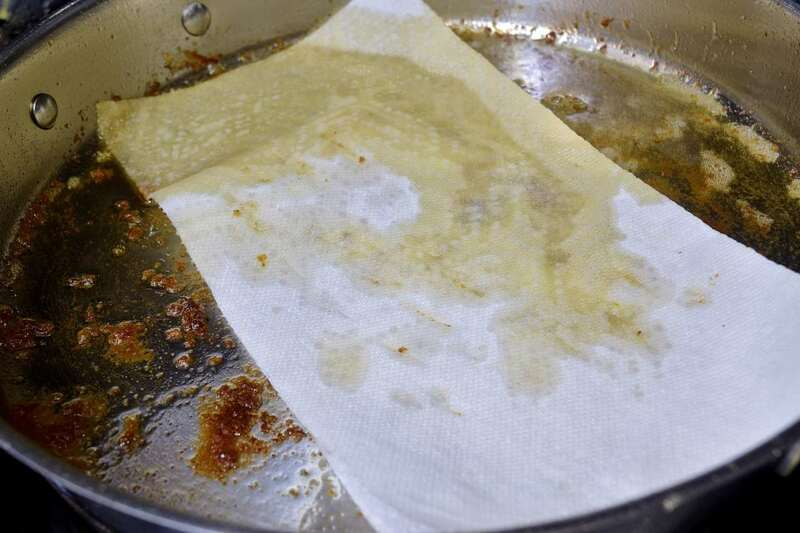 Remove the excess oil from the pan–a paper towel works well for this. Increase the heat to high. 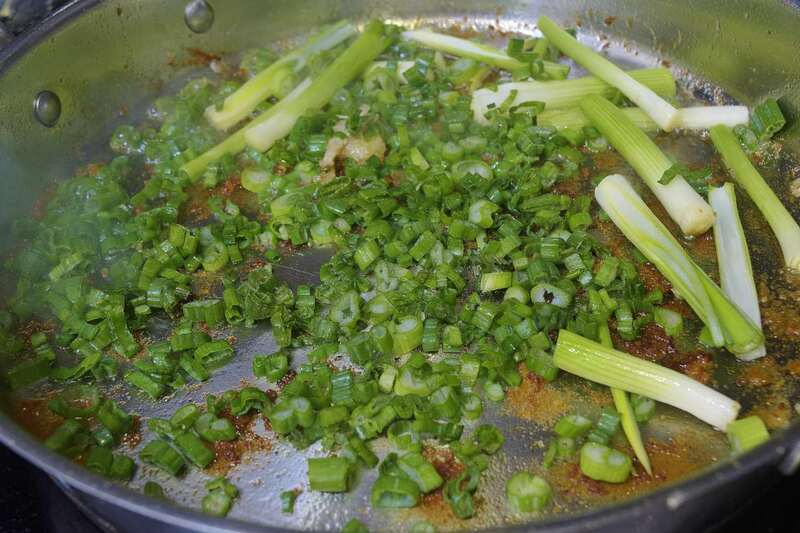 There is still enough oil in the pan to saute the green onions for one minute–avoid stirring, let them sizzle but pull them before they brown. .
remove them from the pan and spread them out flat. Add the white wine to the pan to remove drippings. 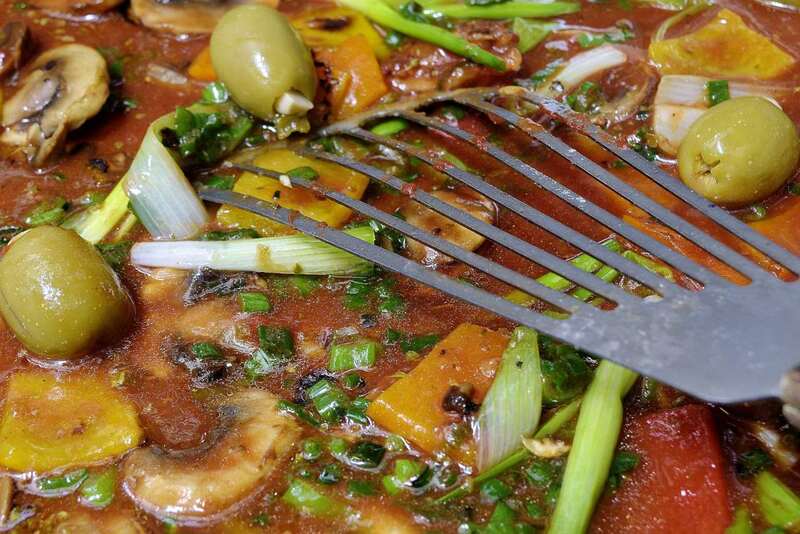 Reduce the wine to almost nothing–wine provides flavor to sauces–NOT volume. Add the tomato paste, the water, the bouillon powder, and the oregano. Bring to a simmer and stir until smooth. There is no need to boil or reduce. Taste for seasoning. Return the mushrooms and green onions to the pan. Add the peppers and the olives. Adjust to medium heat. Add the butter to emulsify and enrich the sauce. Add the chicken to the and make sure it has a coating of the sauce. Do not boil again. 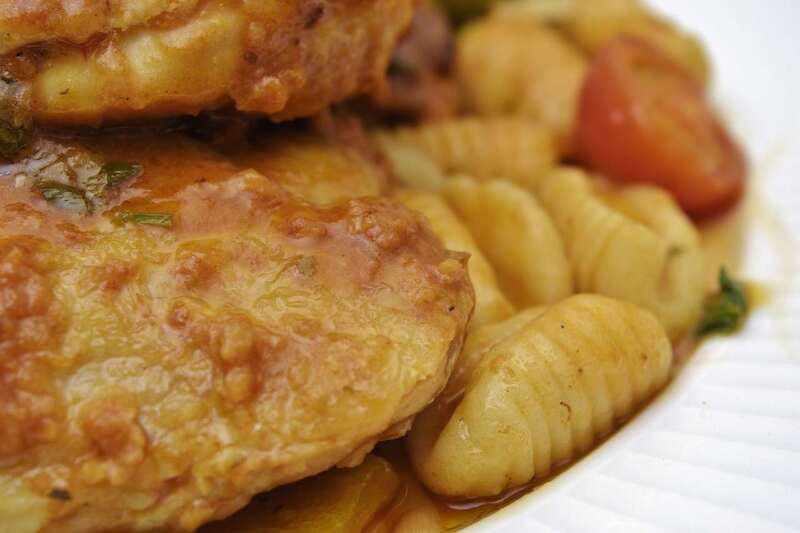 Individually plated Cacciatore can be very impressive when you are having friends over or even for a romantic date. Make sure you have extra napkins, this is a saucy dish!. 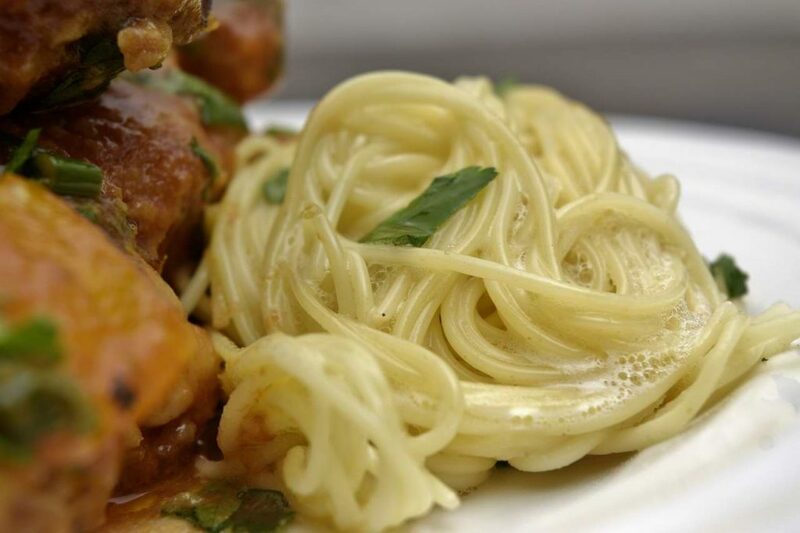 Coils of angel hair pasta make for a vibrant presentation. Gnocchi invokes the rustic feel of the dish. To make your own gnocchi, click HERE. 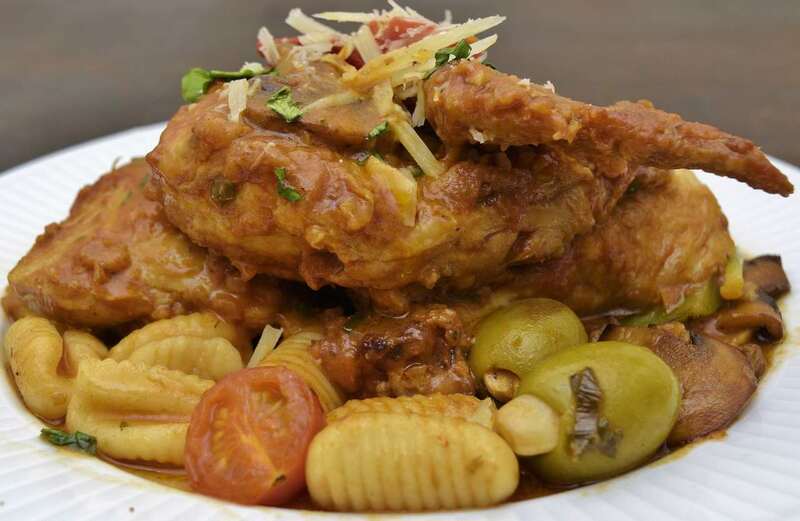 This is another one of those crowd pleasing dishes. 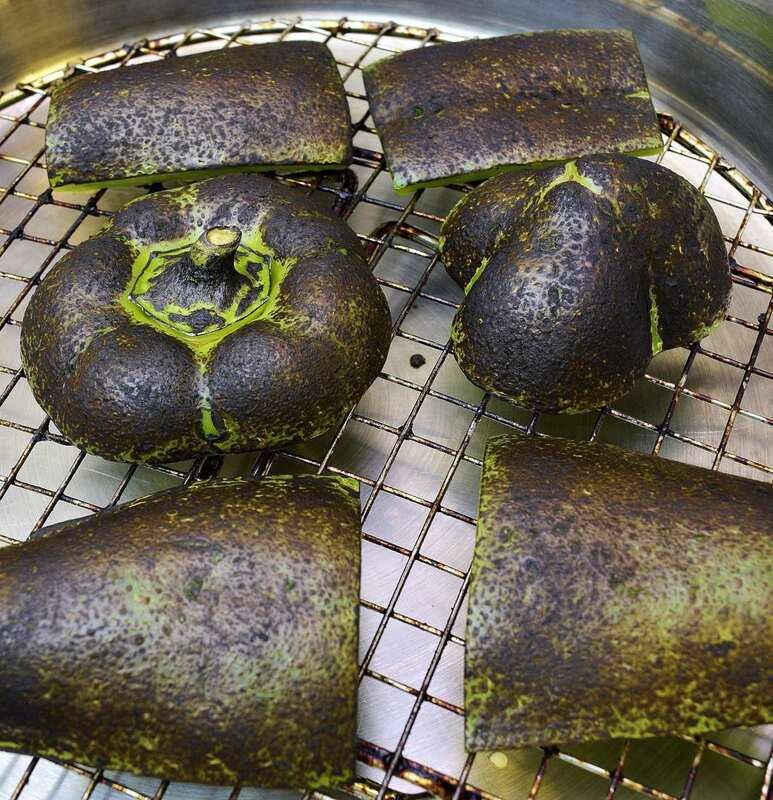 It has just enough mystery behind it to catch people’s attention, but the spirit of the dish is still very accessible. Mouth watering with a pleasing three dimensional profile. Translating to "Hunter style," this dish evokes romantic and rustic imagery that is all at once comforting and adventurous. 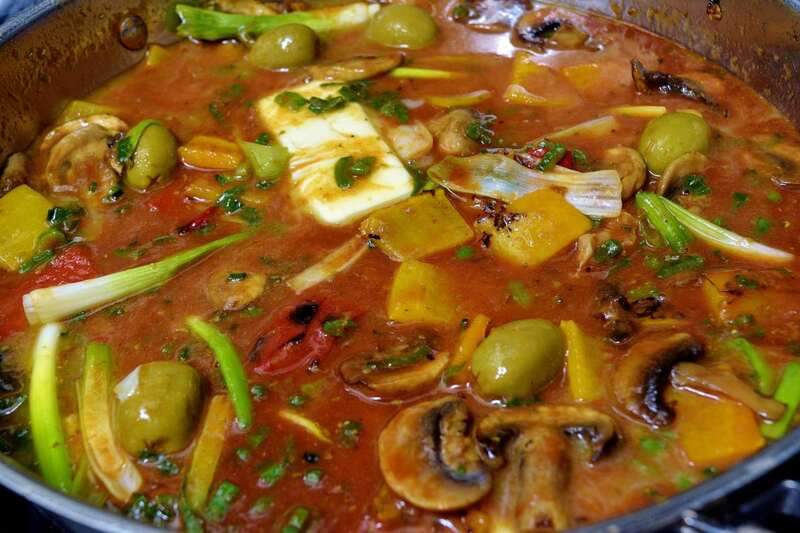 The characteristic combination of tomatoes, mushrooms, peppers, onions, and olives provides the palate with a complex and varied flavor sensation to sort through. 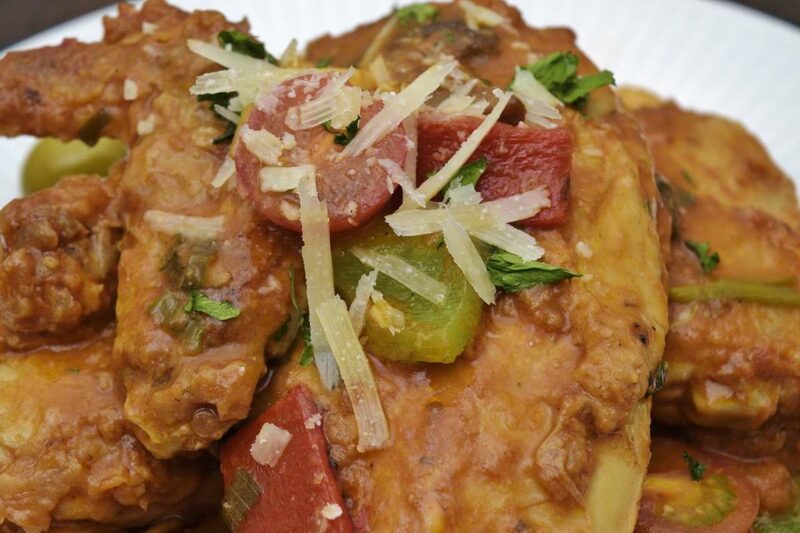 Even though it is most commonly served with pasta, alla Cacciatore goes equally well with rice pilaf or even mashed potatoes. The sharpness of a few shards of Pecorino Romano or other dry hard cheese crowning the chicken provides a surprising tang to all the other flavors.